Batería Y Percusión: Tributo a John Bonham - 8 bateristas tocando "Communication Breakdown"
Tributo a John Bonham - 8 bateristas tocando "Communication Breakdown"
"Tribute to John Bonham" concert finale Octubre 20, 1992, New York. 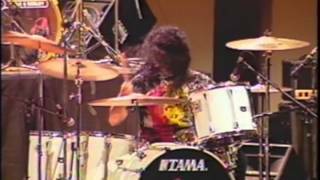 Todos (8) bateristas (Jason Bonham, Ian Paice, Tommy Aldridge, Blas Elias, Bobby Rock, Denny Carmassi, Troy Lucketa, Frankie Binalli) tocando "Communication Breakdown". Randy Jackson en guitarra y voz, Randy Coven en bajo Randy Jackson (eZebra) en guitarra y voz.